September 2014 edited September 2014 in Wishlist! @Steverc which program? There is one in popupcard studio, you change the z number. In MTC you can move layers up and down. MTC. I use the layers, but it would be nice to be able to send a specific item to the back or front or even to a specific layer, instead of creating a new one. @Steverc there is really not a front and back concept for MTC, we use a up and down. You can cut a shape and paste it in place on any layer by selecting the shape, cut it from its layer and paste on the layer you want it to be on (layer will change to grey when it is selected) and you can use shortcuts keystrokes to do it. You can move any layer to the bottom or top and use the arrow key at the layer boxes to rearrange the given layer. I am always moving layers up and down and moving shapes between layers because I do a lot of pnc's. Sending to the bottom and sending to top is sending it to back or sending it to front. Sending to top = front; sending to bottom = back. Concept is the same. It's the front layer and the back layer. Have you tried right clicking on the layers property box when MTC is opened and you have various layers, to see the options there are? To move to the top or bottom, you don't have to do it manually with the green arrow in each layer. Can you send just one selection of a certain layer to the front or back ? Sure. To move to top is one step; to move to bottom is two steps. 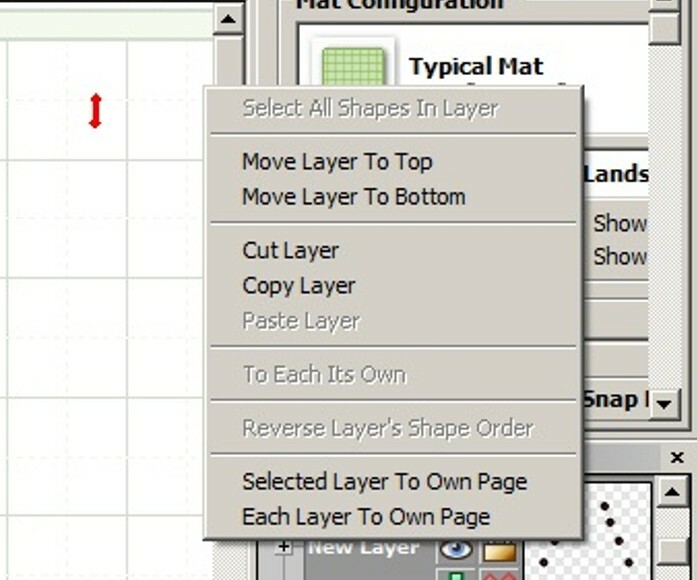 When you have your object selected that you want to move to top or bottom, click on the small green plus sign at the bottom of the layers properties box. Object is moved to top. If you want that object to go to bottom, right click on top layer you just created and click on move to bottom. One step, two steps. MTC has so many features that we can't keep track of them all! Best thing is to click around and see what you get. You always have your best friend with you, go back button! learned something new today. Thank you. I've been doing it one arrow click at a time. LOL! @ Berryone. Does that not move the complete layer contents instead of just one selection of that layer ? @Steverc‌ has a valid point...many graphics programs like Inkscape give you the ability to move an individual object up or down in the hierarchy order (raise, lower functions) or click and drag an object on the layers palette and move it up or down...but this has been on the wishlist for MTC for a long time. This subject has intrigued me. A couple of the graphics programs that I use have this option and it has been very valuable. However, they are not "cutting" software, just printing software or software that allows exporting to import into cutting software. When using Print and Cut. You get ready to print and you have numbers or other objects hidden by your fill color. Thanks Liz_A, I was just making a post in the WISHLIST Category, not trying to start a debate. I was beginning to think, I was the only one still interested in having this in the next version. @HappyCrafter, CorelDraw is a Very big with Sign Makers. @HappyCrafter - I do a lot of print and cut. I like my score lines on top on their own layer, I have my design work which may incorporate a couple of layers, and then I create manual reg marks which are on their own layer at the bottom. I don't often however think, make a new layer now for what I am doing, I just create. After the fact, I have to order things properly, and clicking and dragging either the individual objects OR the layer is just much simpler, I don't know how anyone could not want this feature . Also I can't begin to count the number of times I have hidden a layer and the next shape added to the project invariably ends up on the hidden layer even though I swear I was not on the hidden layer (and I know by watching the webinars I am not the only person that does this or has this happen to them ). That is when I most miss the ability to click and drag a shape ...from a hidden layer to another layer.